Many brides feel that they need to choose a wedding band that blends with the engagement ring; after all, isn’t the engagement ring the star of the show? But that’s simply not the case! There are plenty of ways to spice up women’s wedding sets without distracting from the other ring—and mixing metals is one of the best ways! When choosing which metals to pair, go for color contrast. Warm and cool colors look best when paired together. 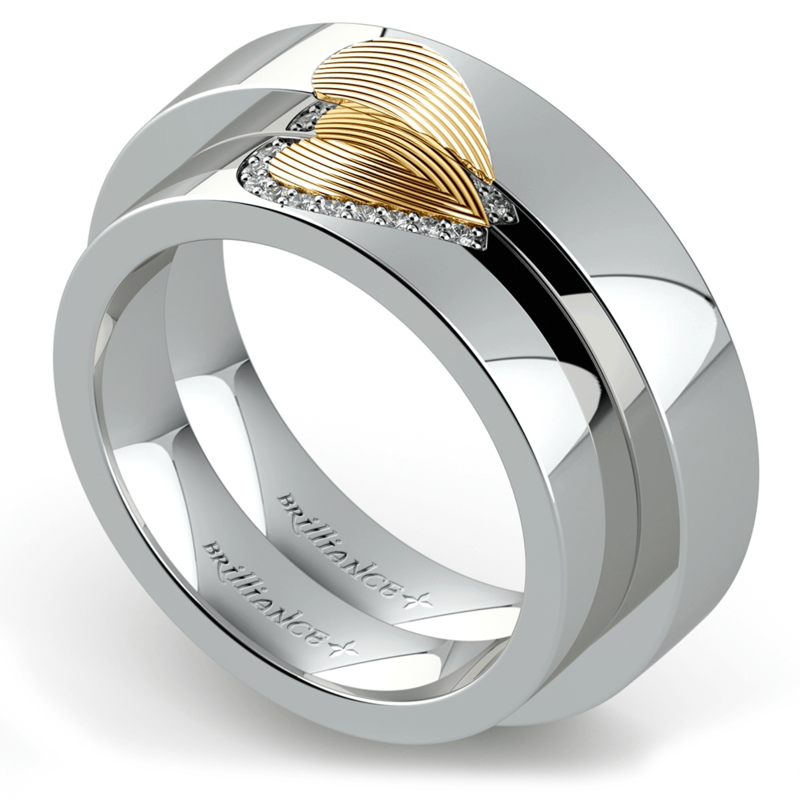 If the engagement ring is platinum or white gold, pick a wedding band set in yellow gold or rose gold. Remember, however, that gold is softer than platinum. Heavy platinum engagement rings may bump against a softer gold wedding band causing dents or small dings, so choose less pure forms of gold for bands (think 14 over 18 karat). These will contain more metal alloys that will in turn strengthen the band. 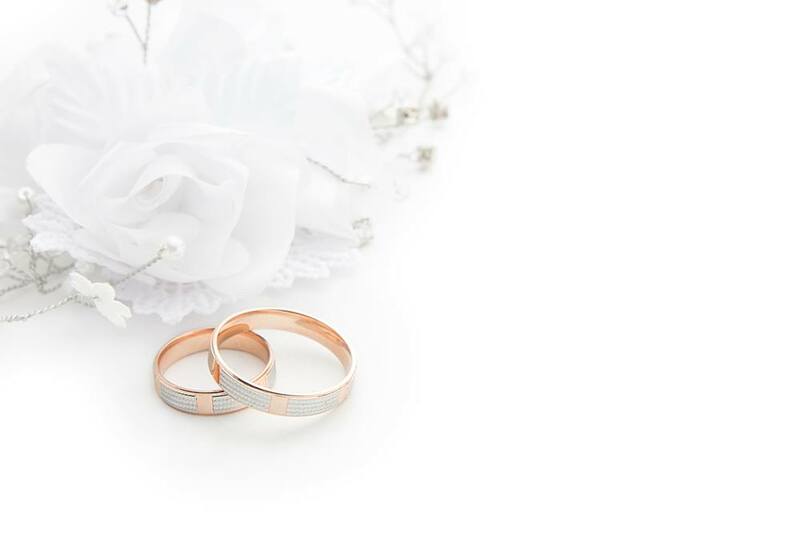 If your engagement ring is a warmer hue of gold, choose platinum or white gold for a contrasting wedding band. Brides want a more affordable alternative to platinum may also choose palladium instead. Some wedding sets also may feature triple hues of gold—white, yellow and rose. This magnificent metal trifecta works best when the white gold is sandwiched between the warmer hues, such as a rose and white engagement ring (like the one pictured below) with a gold wedding band. Some women like a small, plain band that slides in next to the more prominent—and more expensive—engagement ring design, but the wedding band is a symbol of the vows of marriage and deserves to be seen! A great reason to mix metals is so that you can subtly call attention to the band and match your partner’s ring, as well. Mixing metals doesn’t just mean pairing two different types of gold (or platinum, or palladium, or… well, you get the point). You can increase interest by adding texture or a unique finish to your wedding ring to make it pop next to the engagement ring. Think scrolling or floral etched designs, laser-cut details or even twisted metals. 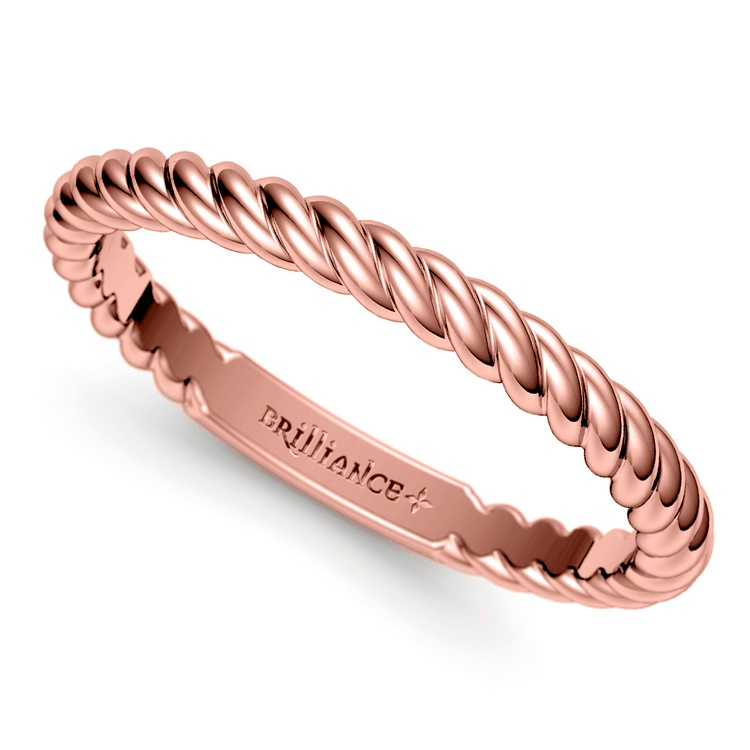 The rope-like details in this rose gold wedding ring adds visual interest and texture. You can pair this with almost any engagement ring for a simple elegant focal point. 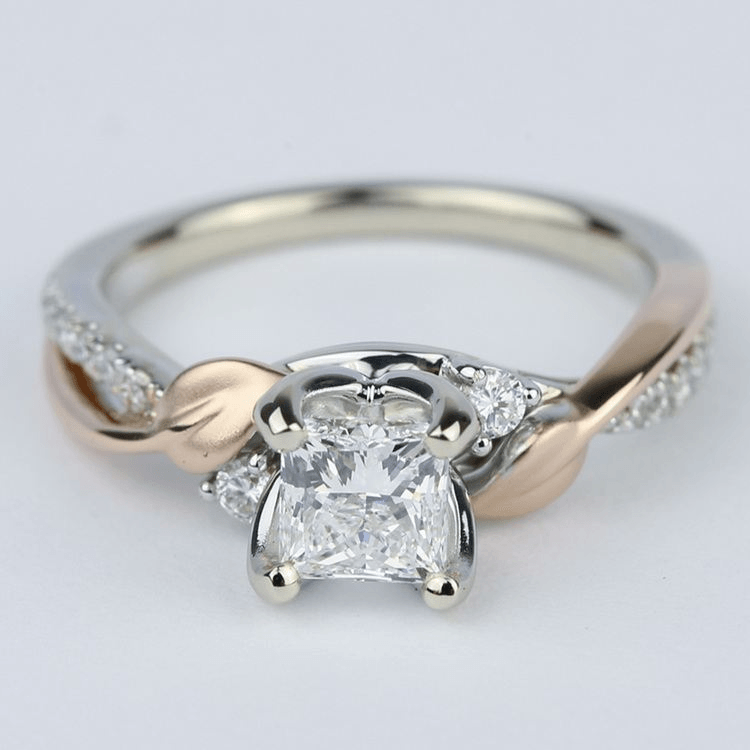 Choose a contrasting metal or the same metal as the engagement ring. Remember, however, that the texture helps set the ring apart when paired with an engagement ring. 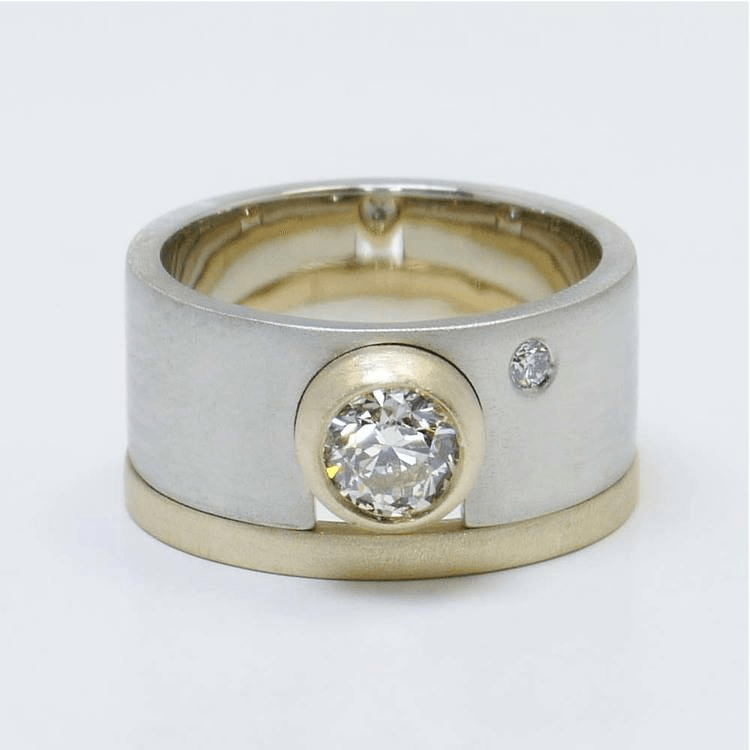 Using one metal with different finishes also looks fantastic, though this is much more common in men’s wedding rings than in women’s. Mixing and matching metals in a wedding band adds depth and design to a ring. Using mixed metals enriches a ring’s dimensions and enables the wedding band to stand out next to the more prominent engagement ring.